Miley isn't the only member of the Cyrus family with a knack for exposing herself. 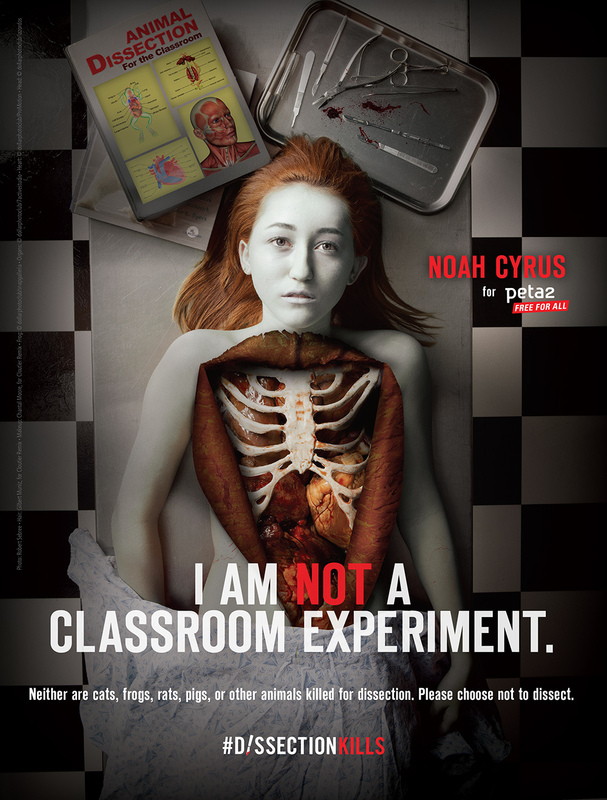 In fact, younger sister Noah takes things one step further by posing as a dissected corpse for a PETA ad protesting classroom animal dissection. In typical PETA fashion, the ad's primary image is crass and confrontational. Noah, a 15-year-old actress, is staring right at the viewer, pale and glassy-eyed, with her chest peeled open to reveal her internal organs. This is paired with the headline, "I am not a classroom experiment." Smaller type adds: "Neither are cats, frogs, rats, pigs, or other animals killed for dissection." The hashtag is #DissectionKills. Asked about the experience of being made up to look like a medical cadaver, Noah said in a statement: "It kind of was weird being on the table, and the feeling of being about to be cut open. The thought of that happening to an animal would be terrible." It might sound paranoid to read into PETA's motives behind choosing Noah, whose connection to her sister allows them to build more advertising around the image of celebrity instead of the thing they're supposed to be caring about. But at this point, PETA's star-chasing is almost more annoying than its knack for empty hyperbole.